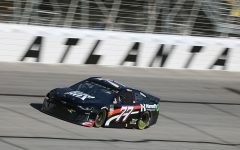 Ricky Stenhouse Jr. topped the speed charts in the first MENCS practice at Atlanta Motor Speedway. Ricky Stenhouse Jr., driver of the No. 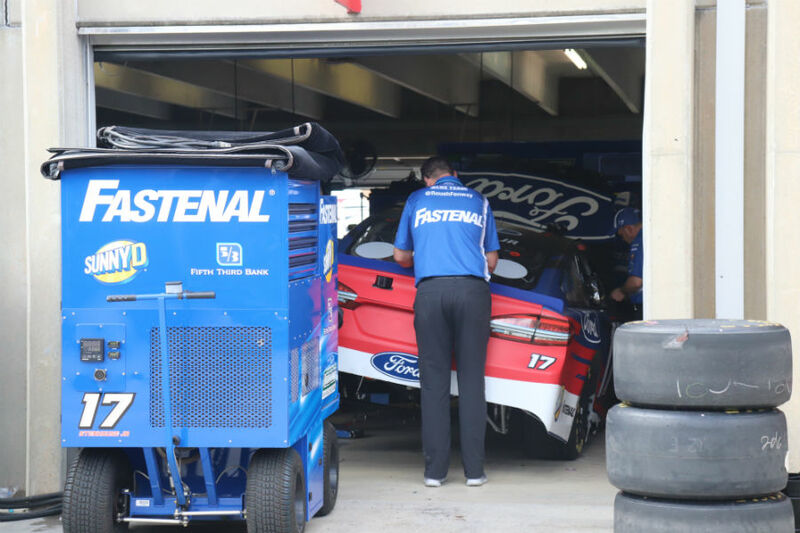 17 Ford for Roush Fenway Racing, ended the first and only Monster Energy NASCAR Cup Series practice session of the day with the fastest speed of 186.384 mph and lap time of 29.745 seconds. He ran a total of 19 laps in the session. Stenhouse Jr. led the practice session as the only Ford in the top five, followed by four Chevrolet Camaros. Kyle Larson, who only turned five laps in the No. 42 for First Data Chevrolet, had the second fastest speed of 185.915 mph, 29.820 seconds. Darrell Wallace Jr. had the third fastest speed of 185.834 mph and lap time of 29.833 seconds. Ty Dillon turned the fourth fastest lap at 185.648 mph, 29.863 seconds. Alex Bowman rounded out the top five with a speed of 185.294 mph and lap time 29.920 seconds. Last year’s MENCS champion, Martin Truex Jr., finished 10th with a speed of 184.572 mph and lap time of 30.037. While 2017 Folds of Honor Quiktrip 500 winner Brad Keselowski finished 24th in this session with a speed of 182.693 mph and lap time of 30.346 seconds. Champion of last week’s Daytona 500, Austin Dillon, finished 28th with a lap of 30.503 seconds and a speed of 181.753 mph. Dawsonville’s Chase Elliott turned 13 laps in the practice session, finishing 29th with his fastest lap 181.574 mph and 30.533 seconds. David Ragan from Unadilla, driver of the No. 38 for Front Row Motorsports. He was 27th in the practice session with a speed of 182.075 mph and lap time of 30.449 seconds. The Monster Energy NASCAR Cup Series drivers get back in their cars at 5:15 p.m. for qualifying later today. 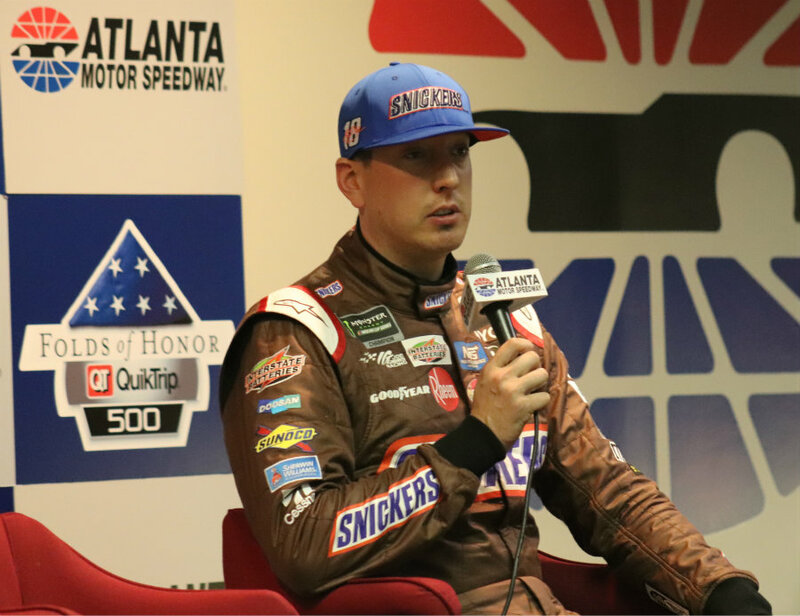 Kyle Busch talks to the media after topping the speed charts in Friday evening's qualifying session. Busch will lead the field to green after turning a lap of 184.652 mph. Kyle Busch will lead the field to green on Sunday after posting the fastest lap in Friday evening’s qualifying session. Busch put the No. 18 Snickers Almond Toyota at the top of the scoring pylon with a speed of 184.652 mph. Ryan Newman, driver of the No. 31 Liberty National Chevrolet for Richard Childress Racing, ran second with a speed of 184.419 mph. Kevin Harvick, in his No. 4 Jimmy Johns Ford for Stewart-Haas Racing, ran third behind Newman with a speed of 184.376 mph. Daniel Suarez ran fourth in the No. 19 ARRIS Toyota for Joe Gibbs Racing with a speed of 184.211. Brad Keselowski, driver of the No. 2 Autotrader Ford for Team Penske, finished out the top five with a speed of 183.850 mph. Several big names did not make it to the final round of qualifying. Seven-time MENCS champion Jimmie Johnson qualified 22nd with a speed of 181.224 mph. Joey Logano qualified 16th at 182.105 mph. 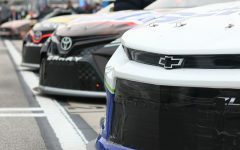 Series rookies Alex Bowman ended in the 18th position and William Byron will start 23rd. Coming off his second place finish last week, Bubba Wallace Jr. qualified 19th with a speed of 181.461 mph. The main highlight of the second round came at the very end when Denny Hamlin knocked Jamie McMurray out of top-12 with just seconds left. Austin Dillon, last week’s Daytona 500 winner, topped the list of notable drivers not making it out of the first round of the qualifying session. He starts 25th alongside Ryan Blaney. The talk of Georgia leading up to race weekend at AMS has been Chase Elliott from Dawsonville, but unfortunately he will start 27th. The 2017 MENCS champion, Martin Truex Jr., did not take a lap during qualifying after his car failed pre-qualification inspection three times. Per the NASCAR rulebook, his car chief has been ejected from Atlanta Motor Speedway for the weekend and Truex Jr. will serve a 30-minute penalty during practice tomorrow. The final MENCS practice starts at 12 p.m. tomorrow afternoon. Crew member for Ryan Blaney checks tire wear on the No. 12 DEX Imaging Ford. Drivers used final practice to find long-run speed in preparation for tomorrow’s race. 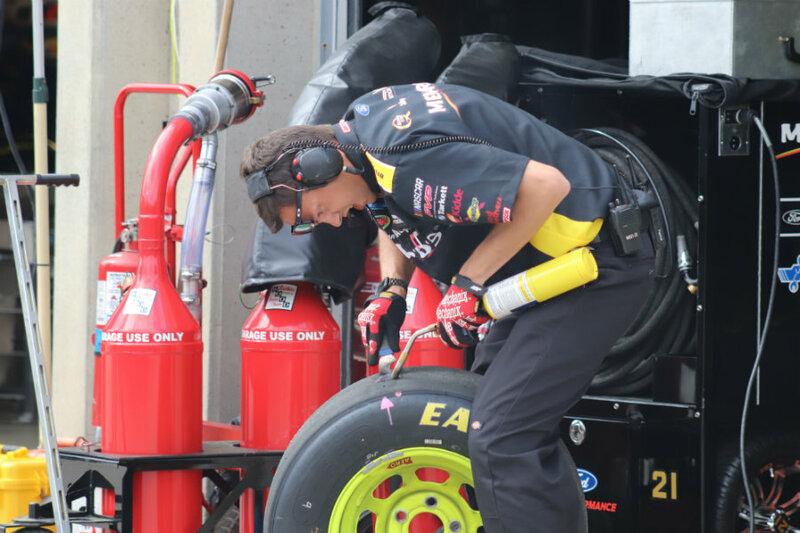 Joey Logano, Team Penske teammate to Ryan Blaney, ran the most laps in the final practice session with 74. Ryan Newman, driver of the No. 31 Liberty National Chevrolet for Richard Childress Racing, finished first during the final Monster Energy NASCAR Cup Series practice with a lap time of 29.989 seconds and speed of 184.868 mph. He ran a total of 49 laps in the session. Ryan Blaney of the No. 12 DEX Imaging Ford for Team Penske finished the practice session with the eighth fastest time of 30.453 seconds, only 0.208 seconds away from the top five finishers. Defending Monster Energy Series champion, Martin Truex Jr. in the No. 78 Toyota, had the second fastest lap time of 30.033 seconds. However, due to failing inspection three times prior to last night’s qualifying session, he will start last in tomorrow’s race. The third fastest lap time of 30.038 seconds went to Paul Menard, driver of the No. 21 for Wood Brothers Racing, only 0.005 seconds off of Truex’s time. Denny Hamlin, in the No. 11 Toyota, finished with the fourth fastest lap time of 30.202 seconds. Joey Logano, in the No. 22 for Team Penske, ran 74 laps in the session and rounded out the top five with a best lap time of 30.245 seconds. Pole winner Kyle Busch finished with the 15th fastest lap time over the 60 laps he completed during the final practice session. Kevin Harvick, who led a race-high 262 laps in last year’s MENCS race at Atlanta, finished 23rd after running 59 laps in the session. Last year’s Folds of Honor QuikTrip 500 winner, Brad Keselowski, finished the session 29th running a total of 60 laps. David Ragan, driver of the No. 38 Fr8 Auctions Ford for Front Row Motorsports, finished the practice session 27th with another Georgia driver, Chase Elliott of the No. 9 NAPA Auto Parts Chevrolet, close behind in 28th. Both drivers completed 56 laps during this practice session. The Monster Energy NASCAR Cup Series drivers finish out the weekend with the Folds of Honor QuikTrip tomorrow. Race officials have moved the start time of the race forward one hour due to the possibility of rain. The race is now scheduled to begin at 1 p.m. Pit crew member for Kevin Harvick blows off the team’s pit stall after rain delayed the start of the race 2.5 hours. In the No. 4 Jimmy Johns Ford, Harvick dominated the 59th Annual Folds of Honor QuikTrip 500 leading a race-high 181 laps. 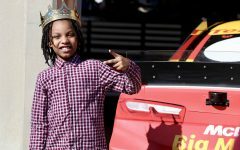 A day after winning the Rinnai 250 in the Xfinity Series, Kevin Harvick dominated the Monster Energy NASCAR Cup Series Folds of Honor QuikTrip 500 at Atlanta Motor Speedway. Driver of the No. 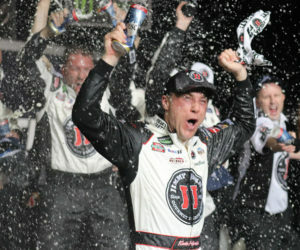 4 Jimmy Johns Ford for Stewart-Haas Racing won two out of three stages and led a race-high 181 laps. Kevin Harvick celebrates his second career victory at Atlanta Motor Speedway. “This track takes a lot of experience and it takes a lot to know about the car and takes time to get the car around the race track,” Harvick said. With all the talk going on about the young guns and their strong start to the season at Daytona, veteran drivers showed their skills, stealing eight of the top ten positions. Chevrolet drivers in the new Camaro ZL1 struggled throughout the race, with only two finishing in the top-ten. Overall, Harvick outran the other drivers, leading the most laps at Atlanta for the fifth time in his career. A distinct strategy of his developed early in the race and helped him dominate the race that was delayed 2.5 hours because of rain. Brad Keselowski, in the No. 2 Autotrader Ford for Team Penske, ran second behind Harvick. Driver of the No.14 Haas Automation Ford for Stewart-Haas Racing, Clint Bowyer, finished third and Denny Hamlin, driving the No. 11 FedEx Ground Toyota for Joe Gibbs Racing, ended the race in fourth place. Last year’s series champion Martin Truex Jr, in the No. 78 Bass Pro Shops/5-hour Energy Toyota for Furniture Row Racing, finished out the top five. Cars began the first stage battling huge storm clouds and the Atlanta Motor Speedway’s old surface, which chewed up their tires quickly. However, Harvick managed to win Stage 1 leading the most laps. 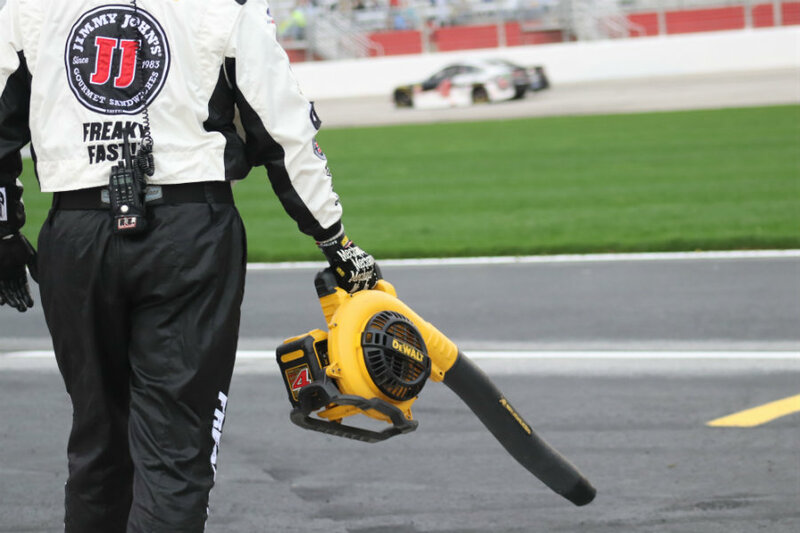 In Stage 2, Harvick dropped to fifth due to pit problems while Keselowski captured first and Kurt Busch was runner-up. When the final stage arrived it was Harvick running away with the victory despite a late-race caution. One lap into the race, Ryan Newman, No. 31 Liberty National Chevrolet for Richard Childress Racing, took the lead from Kyle Busch. Kyle Busch, on lap 18, regained the lead from Newman. But it was Harvick who captured the green and white checkered flag to end Stage 1. Veterans dominated the entire first stage, and the team with the oldest average driver age, Stewart-Haas Racing, had all cars in the top 10. Seventy laps, it was obvious the Chevrolets were struggling, with only Kyle Larson managing a top-ten run to begin the race. Stage 2 started with Harvick losing positions coming off of pit road after trouble on the pit stop. Harvick then restarted 19th after the air gun issue forced him to come back down pit road to make sure all the lugnuts were secure. Kurt Busch, teammate to Harvick, led the most laps in Stage 2 with 37, but it was Team Penske driver Brad Keselowski who won the stage. The threat of rain became a factor to begin Stage 3, adding another layer of intrigue and competition to the race. A battle between Keselowski and Harvick commenced as lapped traffic plagued the two fastest cars. Meanwhile, Hamlin and Joey Logano worked a different pit strategy to potentially gain an advantage. As Harvick pitted under green, Hamlin would take over the lead. Then the pit stops would cycle around to Hamlin and Logano, and Harvick would regain the top position. The strategy seemed to play in favor of Hamlin and Logano who would require one less pit stop, until 28 to go when Trevor Bayne blew an engine. 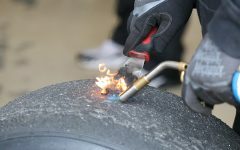 The smoke caused a collision between Bubba Wallace Jr. and Ricky Stenhouse Jr. With the lead drivers all back on the same pit sequence, focus turned to the pit crews and a late-race restart. 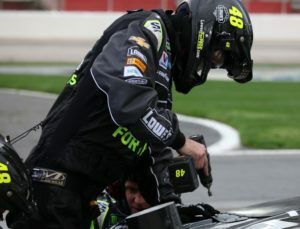 Jimmie Johnson’s pit crew repair his car. The driver of the No. 48 Lowe’s for Pros Chevrolet for Hendrick Motorsports has struggled to start the season finishing 38th last weekend at Daytona and 22nd this weekend in Atlanta. The race restarted with 21 laps to go. Dawsonville-native Chase Elliott, driving the famed No. 9, attempted to charge toward the front, taking the field four-wide, but it was all for nought as he finished tenth overall. Harvick easily took the point and with ten to go had already stretched his lead to 1.844 seconds. He would go on to win the race over second place Keselowski by 2.660 seconds, capturing his first MENCS race win at Atlanta since 2001. “What a good racetrack,” Bowyer said. “I don’t think you’ll find a driver that doesn’t enjoy this place,” Bowyer said. Seven-time MENCS champion Jimmie Johnson’s rough start to the season continued at Atlanta. The team struggled with tire issues early. In addition, he was penalized several times throughout the night for pit road violations and finished 22nd, multiple laps down. Georgia native David Ragan ended his 400th career start in 29th place. Only Harvick and Keselowski secured playoff points throughout the race. Harvick left Atlanta with six playoff points after winning Stage 1 and the race. Keselowski earned one for winning Stage 2. Up next is three weeks of MENCS racing out west. The Pennzoil 400, won by Martin Truex Jr. in 2017, starts at 3:30 p.m. on Sunday, March 4, at Las Vegas Motor Speedway.